It's been quite a year in the Arctic. Over the winter 2015/6 we had the strongest and coldest Arctic polar vortex of the last 68 years. This contributed to a low maximum in Arctic sea ice extent. At that stage only the locals and the scientists were looking, and I wrote about this in a blog post called Arctic sea ice 2016. This was followed by the joint second lowest Arctic summer sea ice extent. Unusual weather in the early winter led to records being broken and the sea ice the Arctic sea has been the lowest recorded in the satellite record for the time of year. Where are we at the Northern winter solstice? The mean Arctic sea ice for the years 1989-93 on 21 December, the sea ice concentration on 21 December 2016 and the difference between the two data sets. Blue shades imply more sea ice and reds imply decreased sea ice compared with the mean. The original data come from the DMSP SMMI data set at the NSIDC. The ice edges have retreated compared with 1989 - but as I wrote about in Record Low Arctic Sea Ice Extent we still have the very low sea ice concentration in the Barents Sea. There is also still a very low concentration region north of the Bering Strait but the the Chukchi Sea and Hudson Bay have mostly frozen over. The temperature and wind field from the ECMWF shows that at the solstice the open water regions are still close to 0°C at (this is the boundary between green and orange colour in the image below). Polar Portal also provide the differences of the temperature from the mean (expected) temperature - the so called anomalies: The reds in the image below are around 10°C above the 2004-13 mean. What we are seeing is - as many have written - a very significant weather event. The Arctic Ocean, much of Greenland and the Bering Strait remain well above the mean (expected) temperatures. The temperature anomaly and wind compared with the period 2004-2013 from Polar Portal. Our eyes are naturally drawn to the reds, but focus on the blues as well. It has been bitingly cold in north western Eurasia over the last month. And North America over the last couple of weeks... Brrrr. One thing I really like about the animation of the temperature anomaly is what you see in Hudson Bay. At the start of the month the temperature is very warm (bright red) , and there was little or no sea ice and the polar bears were stuck onshore. 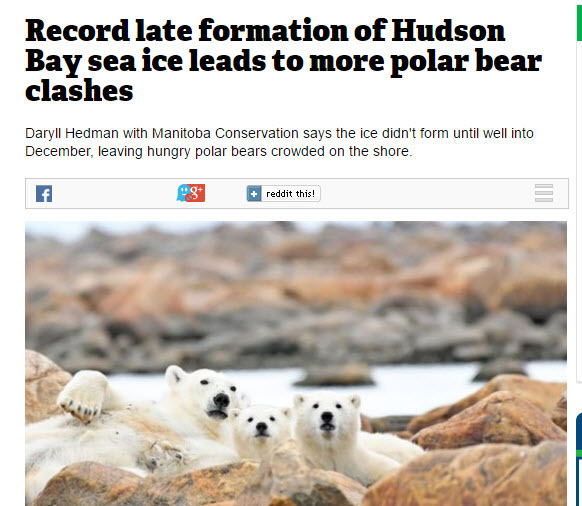 Record late formation of Hudson Bay sea ice leads to more polar bear clashes. The Canadian Press Published on Thu Dec 15 2016. But as the sea ice grows over the bay, the temperature falls below the 2004-13 average. This means that the polar bears can start to move offshore at last. But it's likely not a feel good story. It remains warm in the central arctic and as Maddie Stone wrote yesterday Temperatures at the North Pole Could Rise 50 Degrees Above Normal Today [22 December 2016]. I expect we are going to end up with an overall much thinner mean Arctic sea ice thickness this winter. That is clearly a precursor for what will come next summer. The southern hemisphere has been breaking records too. Sea ice extent has been tracking exceptionally low and a really good overview was written by Peter Hannam in the Sydney Morning Record. So where are we at the solstice? The mean Antarctic sea ice for the years 1989-93 on 21 December, the sea ice concentration on 21 December 2016 and the difference between the two data sets. Blue shades imply more sea ice and reds imply decreased sea ice compared with the mean. The original data come from the DMSP SMMI data set at the NSIDC. In the Bellingshausen Sea the sea ice is still very heavy. These are the the sea ice conditions that stopped the James Clark Ross reaching Rothera Station. Although the latest satellite image from yesterday is showing the sea ice is definitely opening up. In the Ross Sea there is a still a very heavy patch of sea ice offshore, and in the Cosmonaut Sea the sea ice has retreated close to the coast. Between the Ross Sea and the Cosmonauts Sea the sea ice is still quite heavy along the coast. I wonder if they had much trouble with the resupply of Dumont d’Urville and Casey Stations? The plot of Antarctic sea ice extent for 2016 shows how unusual this year has been. Antarctic sea ice extent over the satellite record. In black is the 1981-2010 average and the grey shading is ± 2 standard deviations. In red is the Antarctic sea ice extent for 2016. The chart is from the NSDIC Chartic. The annual cycle plot shows that the weather conditions have been equivalent to shifting the seasonal cycle of extent over a week earlier (the red line is shifted to the left of the black from the middle of October onward). 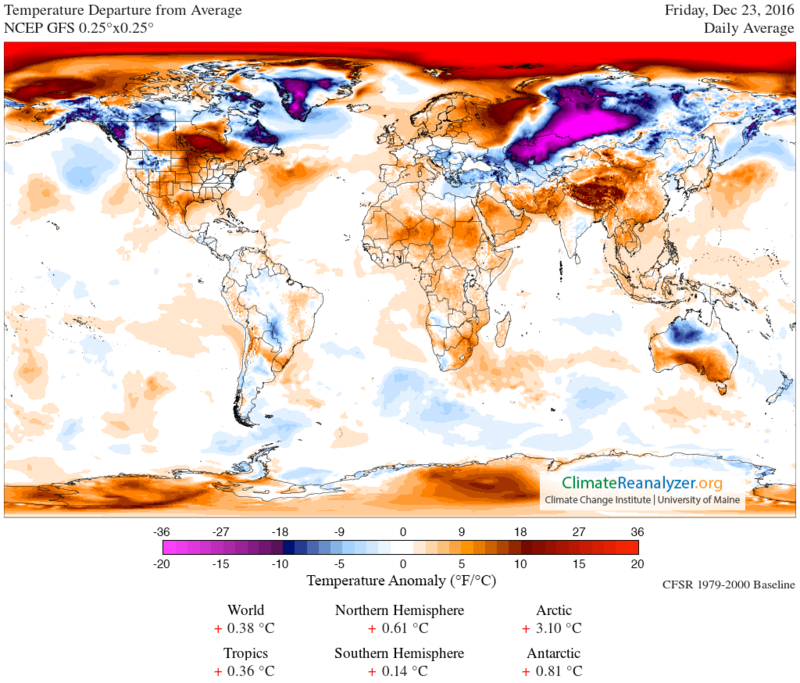 The temperature anomaly from Climate Reanalyzer.org. Temperature at 2 m above the surface in reference to a 1979-2000 climatology derived from the reanalysis of the NCEP Climate Forecast System (CFSR/CFSV2) model. There is no doubt that most of Antarctica has surface temperatures well above the mean - in places >10°C above the reference. There are clearly some large weather events going on in the Southern hemisphere as well (which is why the sea ice is so low!) - but don't worry here - these are anomalies and the surface of Antarctica is still well below freezing in the range -20°C to -30°C. It will be interesting to see how the rest of the winter / summer pans out and to see whether the sea ice will come back into the expected range, or we will get enhanced melting. Each week of melting at peak melt rates is a reduction of about 1.75 million km2 of sea ice. 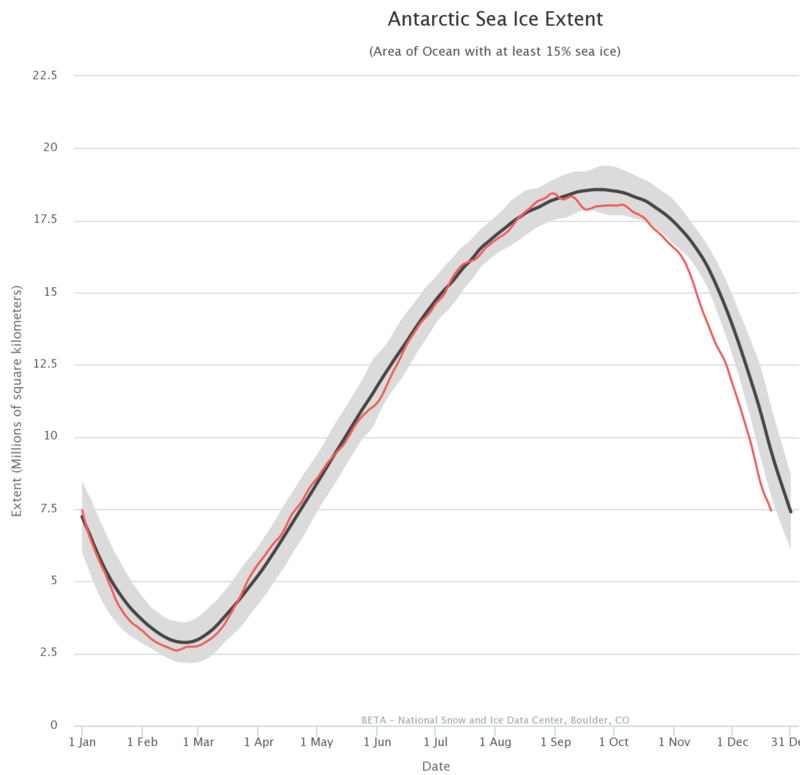 About 7-8 weeks melting and 5 million km2 of Antarctic sea ice extent melt still to go, and then we will find out. Posted in Science. Tags: 2016, Antarctic, Arctic, sea ice, solstice, summer, winter on December 23, 2016 by Mark Brandon.